When we started homeschooling Jude, the general plan was to take it year by year. I wasn't stressing over "What about when he gets to high school?" because he was only in preschool. Yes, I knew it would be here sooner than I imagined, but I really thought we'd make it through second grade before thinking about high school. IF he was still home. Back then, my delusion was he'd catch up by first grade and be back in school with his siblings. And then God said, "HA! You have planned, so I shall laugh. Ha ha ha ha!" Suddenly, I had a high school sophomore in need of a school, because his was closing. My head was spinning like a tilt-a-whirl. Could I homeschool a high schooler? Logistically, it made sense, because our "first choice" school for him was too far to be practical. Academically, it made sense, because we had determined we weren't enamored with the schools that were closer. It was an amazing blessing to be part of the Crew with Jude, because I just said to anybody who would listen, "HELP!!" Thank God, they did! When we decided Matthew would be coming home for high school, it was for many of the same reasons. After having one year of high school experience, I wouldn't call myself an expert, but at least I had some ideas (and Pinterest boards). 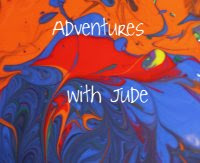 Follow Meg @ Adventures with Jude's board Homeschooling High School on Pinterest. In the end, we decided to bring him home for 8th grade., so that was had a bit of a "trial" year to see where he was at and how he learned without having "this counts for graduation credit" hanging over us from the get-go. It's a lesson we learned with Luke, but it's a different experience planning from the pool deck than the deep end. One of the things a bunch of friends and I realized was that while we definitely aren't alone in homeschooling high schoolers, it feels that way in the blogging universe. So many blogs focus on younger kids and what they are doing, and it seems that high schooling parents are much quieter. It's for a variety of reasons. Our older students are more private, and we try to be respectful of that. They're also independent workers with incredibly varied interests. Finally, our day-to-day essays and papers just aren't as exciting to blog about as arts and crafts. There are a lot of us homeschooling high school, but we just don't know what the others are doing. Hence, this blog hop series. For the next six months, we are going to talk about high school works in our homes. It looks different for each of us - not just in each family, but sometimes from student to student. 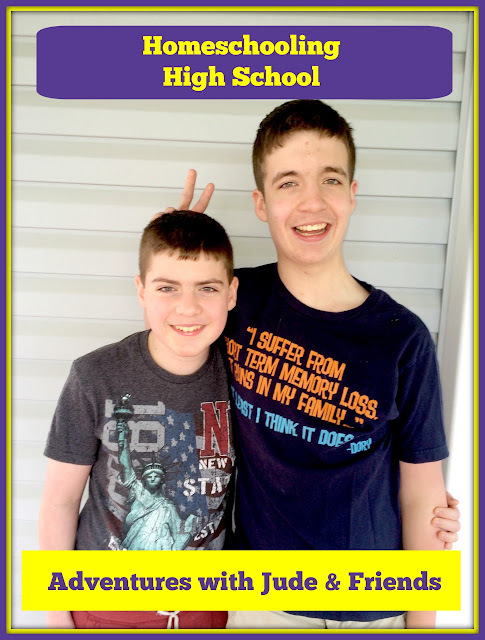 Luke and Matthew are very different in their learning styles and interests, making it challenging to teach the same things in ways that spark their enthusiasm. 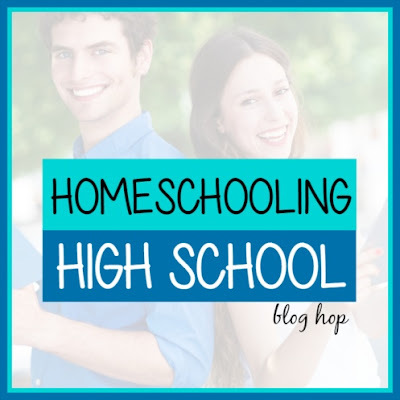 I hope you'll join us for the series and discover how exciting and rewarding homeschooling high school can be! October 28 - "How am I going to teach ... on a high school level?" Now, my hints for homeschooling high school. 1. Network. 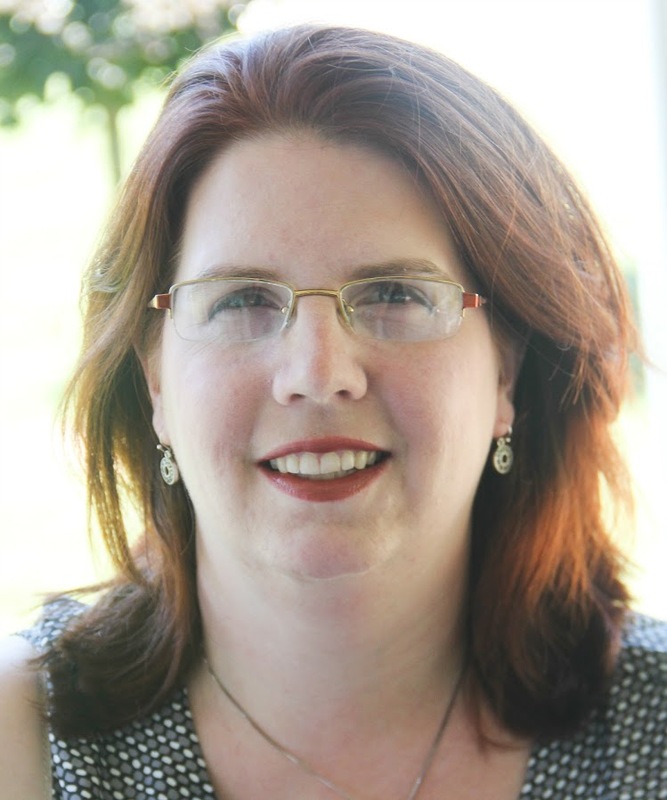 Ask for help from other homeschoolers, even if they're not experienced with high school yet. You'd be surprised what networking can spark. 2. Be prepared to learn alongside your student, but you'll be surprised how much you remember from your own high school days. 3. Academic discussions with high schoolers are fantastic. Sure, it's amazing to watch reading and writing click with a younger child, but now you're watching the dots connect between ideas. 4. Understand that your teen is gaining independent opinions, and you're exposed to all of them, from what topics he wants to study to how much work he thinks is reasonable. Some days, this is good. Sometimes...you'll have a new appreciation for your own parents. 5. Just breathe. You CAN do this. Come share the journey with us!